A bed that converts into a lift chair and safely puts your loved one or patient in bed and allows them to get out of bed without help. ORLANDO, FL, UNITED STATES, October 18, 2018 /EINPresswire.com/ — After successful completion and extended product testing and evaluation, HMS has secured a nationwide exclusive distribution agreement for the My Freedom Lift Bed. Being first to market, The My Freedom Lift Bed artfully combines the benefits of a lift chair with a fully electric hospital bed. The Advanced model retails at $7,995 and is equipped with the GreatCall® monitoring system and also offers an optional air adjustable mattress topper to maximize patient comfort. Neither Traditional hospital beds or leisure consumer adjustable beds provide for ease of transfer to a standing position and often require assistance from others. Lift chairs do not provide the support and comfort of a luxury mattress which makes sleeping or even spending an extended amount of time in them problematic for many. The My Freedom Lift Bed combines the ease of standing with a lift chair and the comfort of a leisure adjustable bed with the Hi-Lo feature of a fully electric hospital bed at one low attractive price. The Advanced model is backed with a ten-year limited warranty. Monthly rental programs are also available. Over 1.5 million people currently reside in nursing homes nationwide. New regulations mandating a minimum of two staff members to assist a resident out of bed for transfer will add millions to institutional staffing costs. The My Freedom Lift Bed can eliminate the need for the two-person assistance requirement as well as allow the patient or resident their freedom and pride with unassisted entry and exit from the bed. Being a Florida based company, HMS selected Orlando, Tampa, St. Pete Florida as the first markets to launch the new My Freedom Lift Bed Basic and Advanced model. 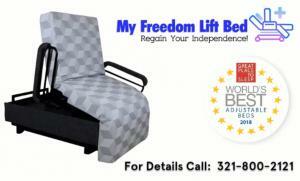 With nearly 2,000 Assisted Living Centers in Florida, Central Florida is home to many of the top rated Assisted Living and Skilled Nursing Home facilities providing a unique opportunity to market the My Freedom Lift Bed. The response has been overwhelming and there is now a wait list for the next supply arriving in early December. HMS greatly underestimated the acceptance of the My Freedom Lift Bed and has stepped up production to match the increasing demand.